Nearly open for a year, Falora has already made Eater.com’s one of the 24 hottest pizzerias to open in United States in 2013. Located in historic Broadway Village, Falora marries a blend of authentic Neapolitan pizza making with contemporary twists. It takes about one to two hours for the oven to reach the optimal 850-degrees for pizza making and while at the lower temperature, Falora bakes its own breads for lunchtime sandwiches. Falora greatly respects the core principles of classic Neapolitan pizza by only using wood to fuel the oven; by making pies around 13-inches diameter; with Caputo 00 flour which is lower in gluten, thus making the dough harder to stretch, and using San Marzano tomatoes and Bufala mozzarella. Pecan wood burns great and adds a subtle flavor to the crust. The pecan orchards in nearby Green Valley are a great resource. According to Shapiro, the Margherita pizza (San Marzano tomato, mozzarella, basil, EVOO.) is the best selling as well as being the essential basic Neapolitan pie, followed by the Cura (San Marzano tomato, mozzarella, parmigiana, soppressata, olives, garlic, and chili oil). Even the creative Fumo (cherry tomato, chevre, smoked salmon, capers, and red onion) has fans. 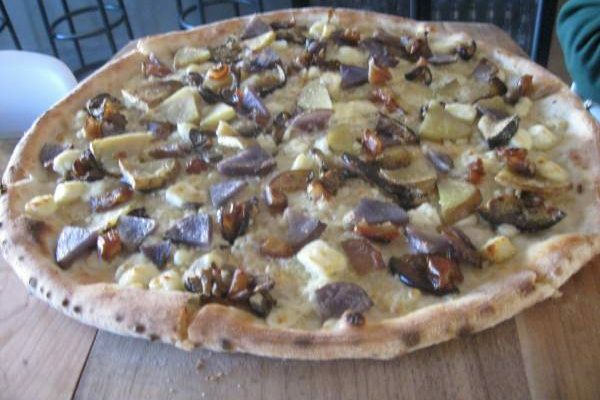 We opted for the Arrosto (feta, eggplant, purple/Yukon potatoes, dates, and white truffle oil) which was both comforting and built curiosity with every bite of salty, textured, sweet, nutty, and earthy. One pie worth mentioning is the Bené Bell (San Marzano tomato, mozzarella, bell peppers, artichoke hearts, and sugar snap peas) because proceeds from this pizza are donated to Ben’s Bells, the project that inspires kindness. The menu features ten pizzas, four salads, two antipizzas – Caprese (heirloom tomatoes, mozzarella, basil, caper & garlic tapenade drizzled with balsamic), and Piastra (chilled zucchini noodles, house-made pesto, cherry tomatoes, and spinach) and a daily sandwich at lunch. The Italian wines and bottled beer list is small but well chosen. Perhaps the biggest and best cup of Americano exists here; the coffee is locally roasted by Caffe Luce. For dessert linger over panna cotta, biscottini baked by Grandma Santi, truffles, and after dinner liqueurs. The menu says bring your own vinyl, we’ll play during the meal. According to Shapiro, this idea spawned amazing results. They started with a baker’s dozen of random records and now have a fantastic collection, all from customers donating old albums. Many also just bring records to listen to during dinner; either way it’s music to his ears. Falora’s first anniversary is March 3. Tucson is going to be thanked in a really big way so stay tuned.